Post prepared by and all images courtesy of Tibor Nadasdy, MD, AJKD Blog Contributor and AJKD Kidney Biopsy Teaching Case Advisory Board member. For a PDF version of the question & answer, please click here. A 60-year-old African American woman with a history of hypertension and untreated hepatitis C virus infection presents with a rise in her serum creatinine from 1.0 mg/dL (eGFR, 71 mL/min/1.73m2 per the CKD-EPI equation) to 3.4 mg/dL (eGFR 16 mL/min/1.73m2) over two months. She is found to have nephrotic syndrome and a urine protein/creatinine ratio of 8 g/g. Cryoglobulin test (cryocrit) was weakly positive, but rheumatoid factor was only 16. Serum C3 and C4 were 148 mg/dL and 51 mg/dL, respectively. She tested negative for HIV. Ultrasound revealed normal-sized kidneys with no hydronephrosis. A kidney biopsy was performed. What is the diagnosis? Paraffin sections for light microscopy contained 15 glomeruli, five of which were globally sclerotic. 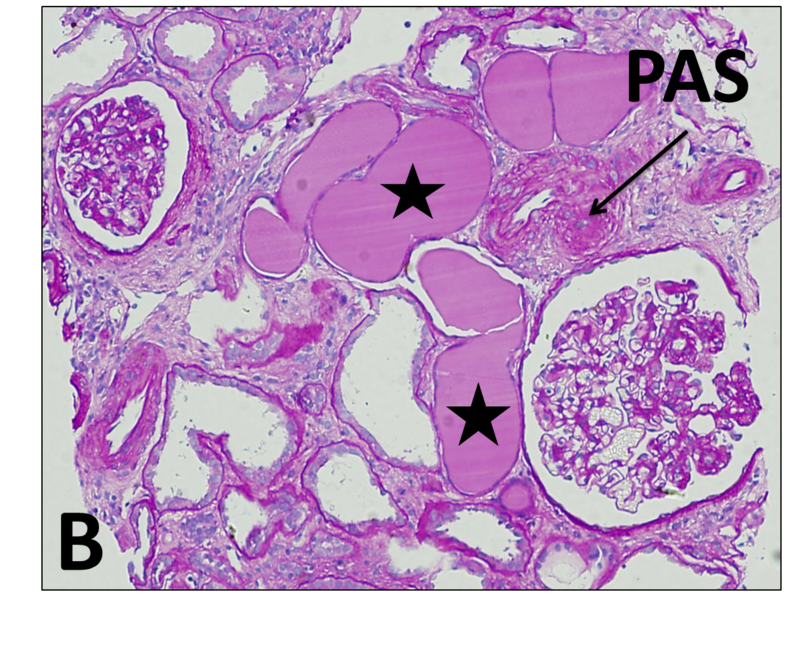 In three glomeruli, segmental to global glomerular capillary collapse was seen with prominent overlying glomerular epithelial cells (Image A below, arrows). The remaining glomeruli were somewhat enlarged, but otherwise unremarkable (Image B below). There was moderate interstitial fibrosis and tubular atrophy with moderate lymphoplasmacytic interstitial inflammatory cell infiltrate. Several tubules showed microcystic dilatation and contained homogeneous hyaline-like material (Image B, stars). Focal obliterative thickening of the arterioles was noted (Image B, arrow). Tissue for immunofluorescence contained six glomeruli; no immune complex deposits were noted. 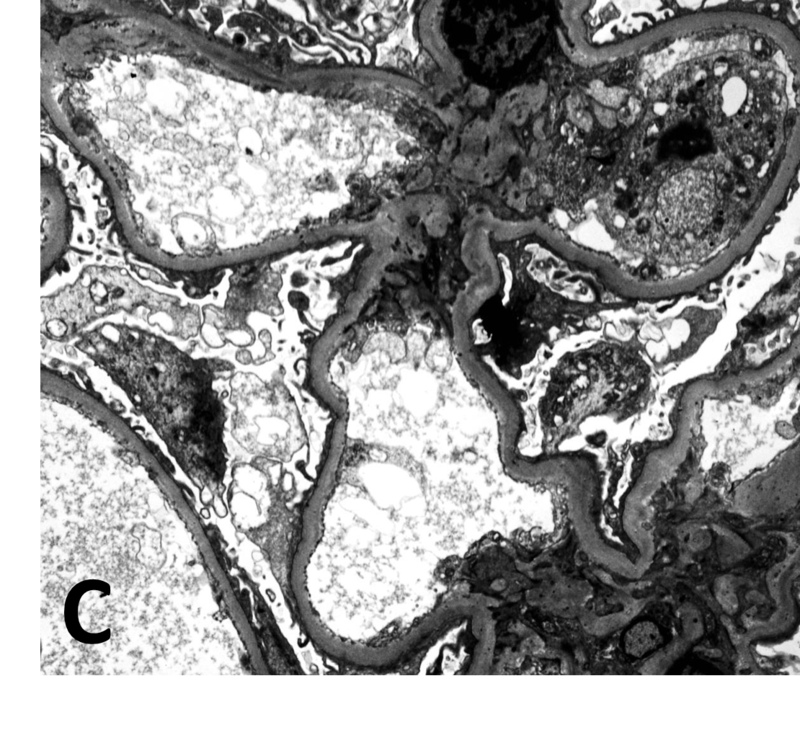 Ultrastructural examination revealed unremarkable glomerular capillary loops with no electron-dense immune-type deposits and approximately 60% effacement of the foot processes (Image C below). Endothelial tubuloreticular inclusions were not seen. Collapsing glomerulopathy may be secondary to HIV infection (HIV-associated nephropathy); however, this patient is HIV negative. Hepatitis C virus infection is not associated with collapsing glomerulopathy unless the patient was treated with interferon; interferon treatment can rarely be associated with collapsing glomerulopathy. There was no history of interferon treatment in this patient. Rarely, other viral infections, such as parvovirus infection, have been associated with collapsing nephropathy. In addition to interferon, other drugs, such as pamidronate, can cause collapsing glomerulopathy. In this patient, there is no clear cause; therefore, the collapsing glomerulopathy is best considered idiopathic. However, it is important to note that the patient is an African American woman, and collapsing glomerulopathy is more common in African Americans with APOL1 risk alleles (this patient had not been tested for that). Collapsing glomerulopathy has quite characteristic changes, not only in the glomeruli (collapsing glomerular capillaries with prominent epithelial cells filling the Bowman space) but frequently in the tubulointerstitium as well, including interstitial inflammation, fibrosis, and microcystic dilatation of tubules. This patient had all the characteristic findings of collapsing glomerulopathy. 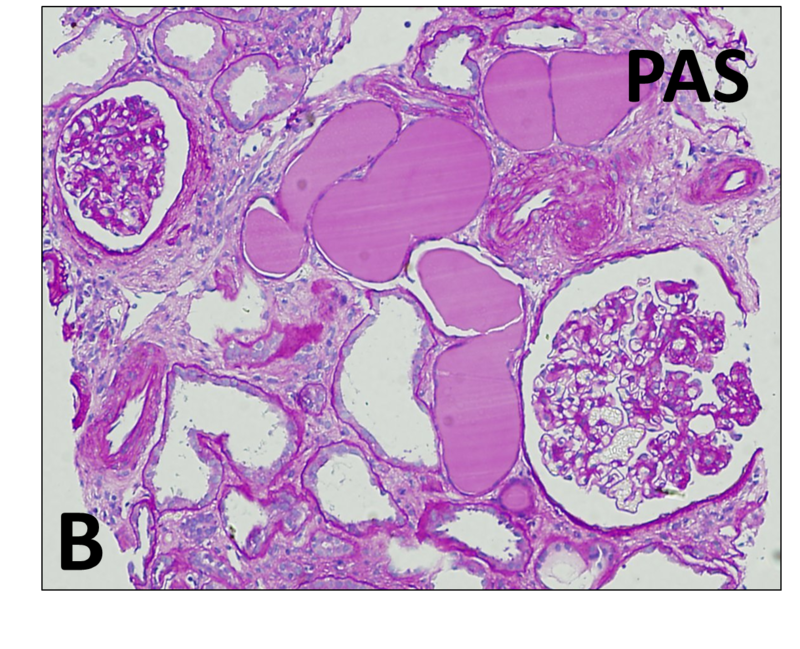 Occasionally, the prominent glomerular epithelial cells filling Bowman’s capsule may resemble a cellular crescent (“pseudocrescent”). However, in true cellular crescents, the glomerular capillaries and Bowman capsular basement membrane are frequently disrupted, and the epithelial cells in the Bowman space are admixed with inflammatory cells and fibrin. 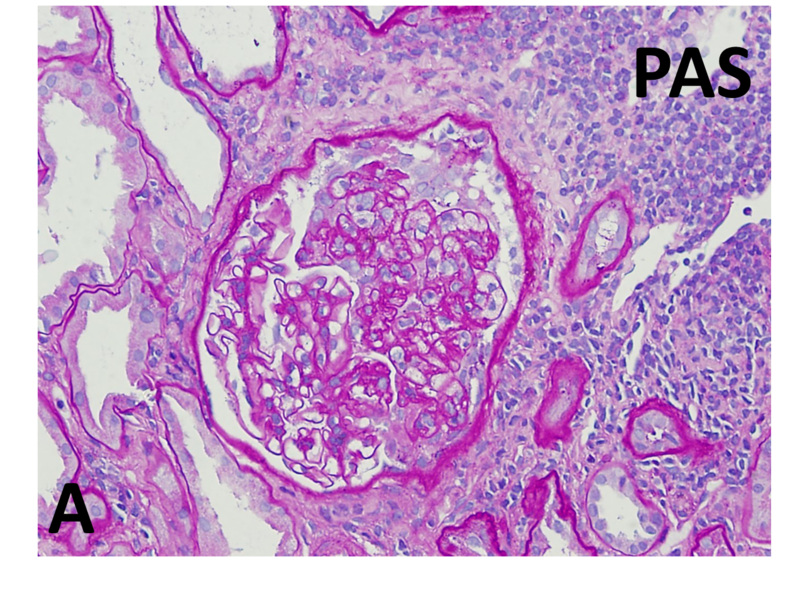 In the collapsing variant of FSGS, the hypertrophic glomerular epithelial cells probably represent podocytes (visceral epithelial cells), but there is increasing evidence that parietal epithelial cells also contribute to the glomerular epithelial hyperplasia. Differentiating the collapsing variant of FSGS from the cellular variant can be difficult, particularly if the collapsing variant is in an early stage. In fact, there were some investigators who designated glomerular capillary collapse with prominent overlying epithelial cells as the cellular lesion. According to the Columbia Classification, the cellular variant of FSGS is defined by segmental endocapillary hypercellularity with subsequent glomerular capillary obliteration, with or without glomerular intracapillary foam cells, hyalinosis, infiltrating leukocytes, karyorrhexis, and epithelial hyperplasia. The presence of prominent glomerular epithelial cells in the cellular variant of FSGS makes the differentiation from the collapsing variant difficult. This is reflected in the literature; studies on FSGS using the Columbia classification report large differences in the frequency of the cellular variant (between 0 and 27 percent). This explains why the cellular variant is the most poorly understood among the different variants of FSGS. 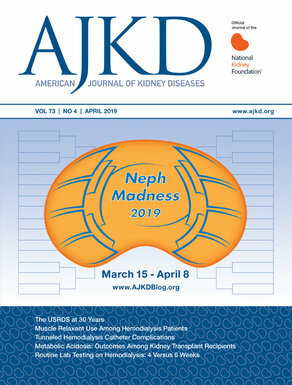 To view the related installment on Collapsing Glomerulopathy (freely available), please visit the Atlas of Renal Pathology II at AJKD.org.